Until last decade, traditional media like TV, radio, newspapers, magazines were popular among the marketers to advertise and promote businesses. But over the last few years, with the rapid growth of Internet usage, marketers shifted to online ad spending at the expense of traditional formats. According to new report by eMarketer, one in every five ad dollars spent globally now go to internet advertising. As per its estimates online ad spend worldwide will reach $107.33 billion by the end of 2012, up from $88.47 billion last year. It is also expected to surpass TV, Radio in the coming years. So, in order to serve the industry needs there is and will be a huge requirement for Internet marketing professionals. India is considered as a global leader in outsourcing, despite strong competition from many other countries including China, Mexico, Ireland and the Philippines. It managed to outsmart them and emerged as the top outsourcing destination. Many companies located in US, Europe, Canada, Australia, UK, etc., are outsourcing their Internet marketing needs to India. With the growth of online marketing services industry in India, this field is in need of good number of skilled graduates to handle various roles. Following are the career options available in Internet marketing for the upcoming graduates. Web marketing/SEO specialist: This role deals with optimising a website to make a website rank high on search engines and get more traffic. PPC specialist: This job role deals with conducting, monitoring and tracking the performance of paid search campaigns; creating reports and presenting recommendations. Web research specialist: Web research analyst gathers and analyses market data by conducting Internet, telephone, or email surveys to study the changing trends. Content/Copy writer: The role of a content/copy writer is to create good quality content for websites, brochures, product/service descriptions, etc. Link building specialist: Link building specialist develops numerous quality and relevant inbound links for a website so as to get good page ranks and popularity. Email marketer: Email marketer conducts email campaigns – creates database of email addresses, sends powerful marketing messages and tracks the results of the campaign. Web developer: The web developer’s job is to create websites/web pages which are SEO-friendly. S/he also updates and maintains the website. Web/graphic designer: Graphic designer provides the required graphic work to the website like images, logos, layout, etc., to give an appealing look. Huge demand: Internet marketing industry, though new, is growing at a fast pace and requires sufficient man power to match the demand. But, on the other hand, there is lack of experienced and skilled professionals, thus, creating a demand-supply gap. Therefore, for those who are interested to start a career in web marketing, this is the right time as many opportunities are awaiting them. Variety of jobs: Internet marketing is a combination of various marketing tasks that improve search engine rankings to a website. Hence, this field deals with diverse and dynamic job roles and responsibilities. Possessing few attributes such as creativity, research abilities, analytical and coordination skills can make you eligible for these job roles. 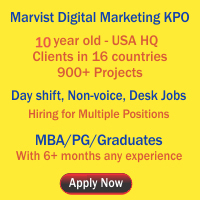 Desk jobs and flexible working hours: Internet marketing jobs are solely desk jobs. These jobs target Internet audience, hence, there is no need for the employees to go around the customers physically. Further, except when required to communicate with clients abroad, there is no need for the employees to do night shifts, thus, enjoying day shifts and flexible working hours. Scope to learn and excel in one area: The field of Internet marketing provides a wide scope to learn. All the concepts are new and vast, hence there is also a lot of opportunity to explore. You can use the same knowledge to experiment at work so that you can have a real time experience which helps gain expertise. Interesting tasks: The job roles in Internet marketing are creative and interesting. Little observations and small modifications can bring substantial results in the search engine rankings. Studying and identifying the ideas that work positively/negatively, identifying patterns of growth, customer behaviours, competitors strategies and then customizing the marketing strategies accordingly to bring good search engine rankings. Challenging roles: Competition is rampant in Internet marketing industry. People strive hard to bring their sites to the top ranks – this makes the role of Internet marketer highly challenging as he should compete consistently for the top places in order to show substantial impact on the client’s business. At any given moment, he is required to understand company’s goals, customer preference and industry trends and design a marketing strategy out of it that proves successful for client’s business. Impact of performance is clearly visible and measurable: Unlike other professions where you have to wait till the end of the project to see the results, Internet marketing allows you to see results instantly. You can clearly view how your performance impacts the page ranks and search engine rankings of a website. The moment you apply some marketing strategy, it starts working and after a few days you will come to know the results of your work. Decent pay: Jobs in search engine marketing require basic skills like good aptitude, communication, written communications skills and commitment; you need not have costly degrees with you. However, people with Masters in marketing are preferred. Hence, even an average candidate with the above elements can expect a decent pay. As there are more jobs than the skilled professionals, the salaries can be in high range. Job satisfaction: With Internet marketing you help other businesses grow. For you it is just a job, but for your clients it is their business. This kind of ‘feel’ that your performance affects your client’s business gives you high job satisfaction, which is important to perform better continuously. Job satisfaction will not only help you get expertise but also enables you to settle down in the career much faster. If you are looking for a stable career, Internet marketing could be one of the best options, as this field is going to experience huge growth in the next 10-15 years. Many major companies related to Internet like Google, Yahoo, Facebook, etc., has already started operations in Hyderabad and in other cities like Delhi, Mumbai, Bangalore, and . As the scope for Internet marketing is high, we can expect more number if industry giants to come to India. As the industry is in the budding stage, competition is less and thus is the appropriate time for you to start your career. Moreover, very few people in India know about Internet marketing. So, by the time the field becomes popular you can become an expert with around 3-5 years of experience and expertise. This entry was posted on Jul 2012 at 5:31 PM	and is filed under Careers, Marketing Jobs in Hyderabad > MBA Marketing Jobs > SEO Jobs. You can follow any responses to this entry through the RSS 2.0 feed. Your Feedback Matters!